These beautiful contour wedding bands from the Miadora Collection feature round white diamonds set in stunning sterling silver. Designed to fit both above and below a round diamond engagement setting, these exquisite anniversary style wedding rings incorporate a dazzling high polish finish that complement the glittering diamonds with outstanding ease. All weights and measurements are approximate and may varyslightly from the listed information. *T.W. (total weight) isapproximate. 1/10 carat T.W. may be 0.08 to 0.12 carat. Treatmentcode N (White Diamonds). See Treatment Guide for furtherinformation. For our 10 year anniversary, I received a new wedding ring, which had incorporated my original wedding band. After receiving my ring I went on the search for a new wedding band, something simple, yet elegant. After many months, 4 to be exact and many hours reading reviews I came across the Miadora open circle set. I cannot be happier with my purchase, it is exactly what I had envisioned and so much more. 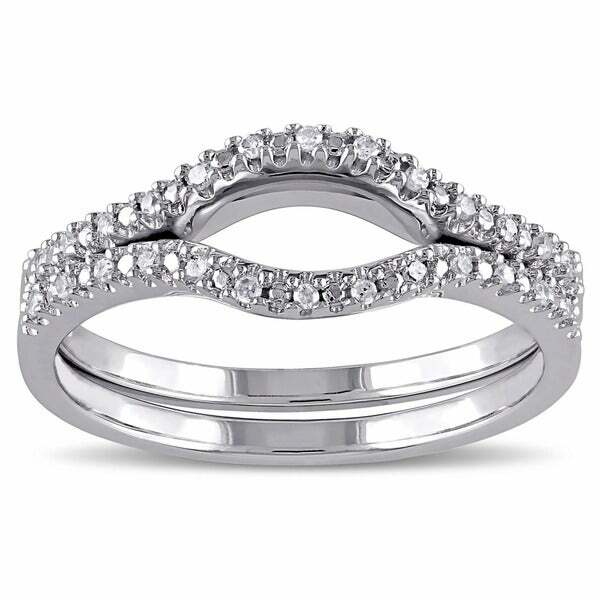 The bands are dainty, sophisticated and are a perfect accent to my wedding ring. You will NOT be disappointed with this purchase. I may also add, the ring is very true to size. True to the listed size. My wife and I both bought these, so that we would have matching wedding bands for our different style rings. 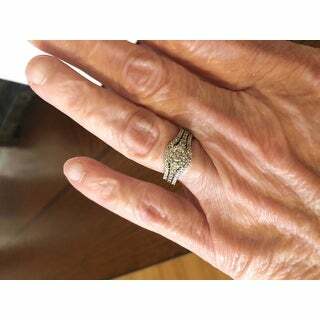 These bands fit perfectly around my round ring and even look great around my wife’s square ring! Amazed at the quality, we’ve had them for 1.5 year now. I bought this to pair with a 1 1/10 carat cushion cut solitaire and couldn't be happier. 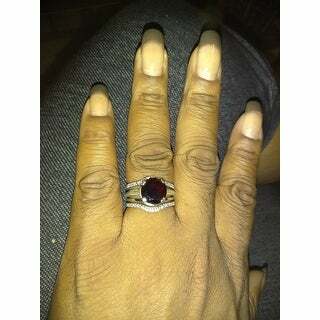 It makes my ring pop and I have gotten so many compliments on it. You can't beat the price either. This is exactly what I’ve been searching for! Got a new engagement/wedding ring combo but just didn’t like the single style! Bought this to enhance my ring! Looks beautiful now! Only drawback to wearing three rings is the constant twisting of the three and having to readjust them! May need to have them permanently attached to remedy this! I fell in love with the arrangement of the diamonds. Tried it with my engagement ring and it looks absolutely stunning. 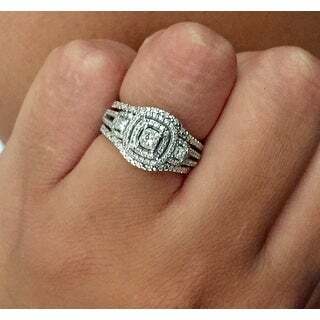 I would recommend this item if your looking for a beautiful wedding band! This ring set far exceeded my expectations! For the price, I wasn’t sure what to expect, but I figured I’d give it a try. I wasn’t disappointed. 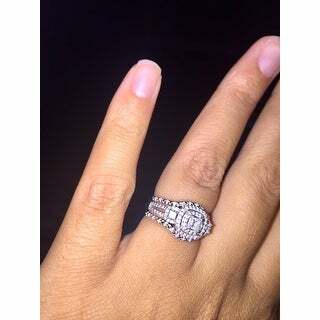 The diamonds sparkle and the ring color is beautiful. It’s a perfect pair with my larger round ring! So impressed by this wedding band set! It fit my engagement ring perfect. I didn’t want to spend a lot and this was an amazing steal. I wear a size 5 and I ordered a size 5 and it fits great. No complaints. Only tried it on so can’t say much about durability, but it’s definitely worth buying. Can’t wait for the wedding now! Absolutely love this! It makes my 1920's replica art deco ring pop! I have only had them about a week and a half, i get married in 2 and a half weeks.. But so far, so good. They match up with my ring well and are worth what we paid..
Beautiful quality, fit perfect, compliments my engagement ring beautifully!!! Glad I took the chance! 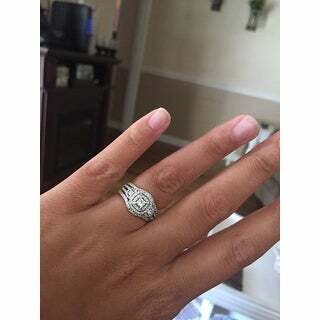 This ring came on time and is beautiful with my halo ring!!! I was worried it would fit correctly but it did!! I am so happy with our purchase!! I posted a picture with and without so you can get the shape of how it fits! I haven't worn it long enough to be able to say if it gets tarnished real easily or not. This didn’t quite work for me, it didn’t fit around my ring. But the return was super easy, definitely recommend a Overstock, the quality was great! I love it so much!!! A year later and it still has that sparkle.. it Fit perfectly and was everything I was looking for! Shipping was fast too! Exactly as advertised. Beautiful rings. Just what we were looking for to go with my double Halo engagement ring. Exactly as was presented on the website. Love the rings. Beautiful set for the price, however I had to return because it did not fit with my wedding ring the way I had hoped. 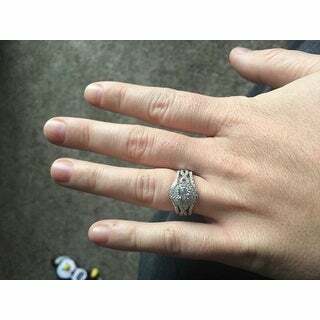 While the rings are not a perfect fit, they come very close.The added sparkle makes my ring shine and the stones are a good size for the price. Very happy with this purchase. "What ring does this fit around? 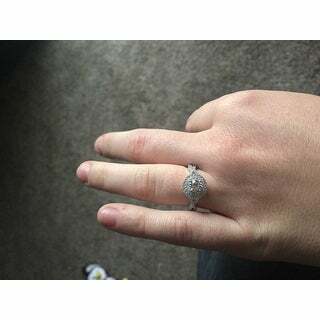 I really like this setting but need some ideas of what rings sit in it perfectly"
"do you have a ring enhancer sterling or 10k with cz for a cushion setting?" 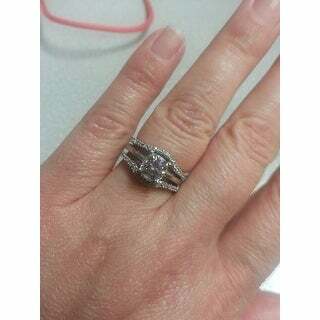 "will this band fit with #RGF50719, ring is from overstock round shape"
"are these two bands or one?" "Will these bands fit with item#19108804? Thanks!" 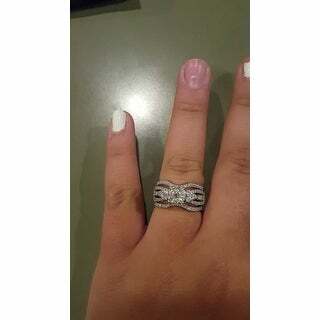 "Does this ring fit the "Miadora 1/2 CT Diamond TW Fashion Ring 10k White Gold GH I2;I3" Engagement ring?" "Does anyone know the measurements of the curve on this ring? I'm looking for something that has a 7mm wide curve that is about 2.3mm deep." The ring dimensions are approximately: 20.2 mm wide x 6.8 mm wide x 3 mm deep / Band Width: 3.2 mm wide.